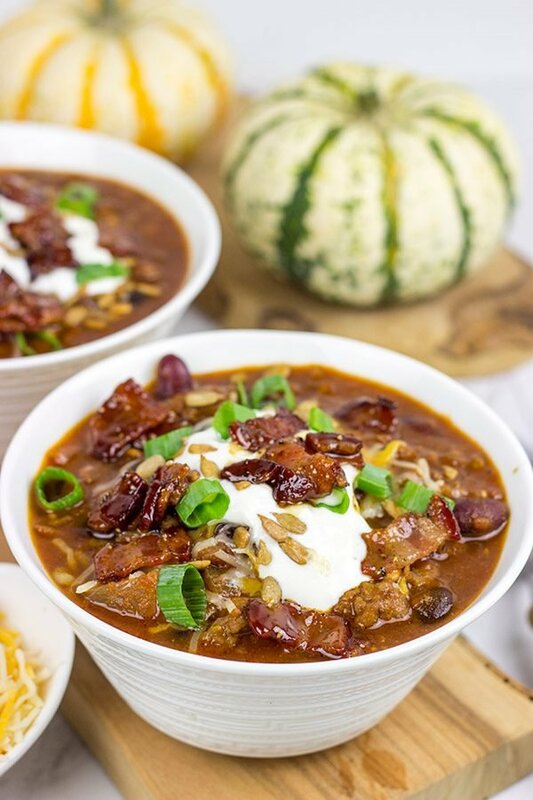 This Maple Bacon Chili is topped with maple candied bacon for an extra special layer of flavor! It’s the perfect meal for a chilly (no-pun intended) Autumn evening! Maple syrup…in chili? Trust me on this one! 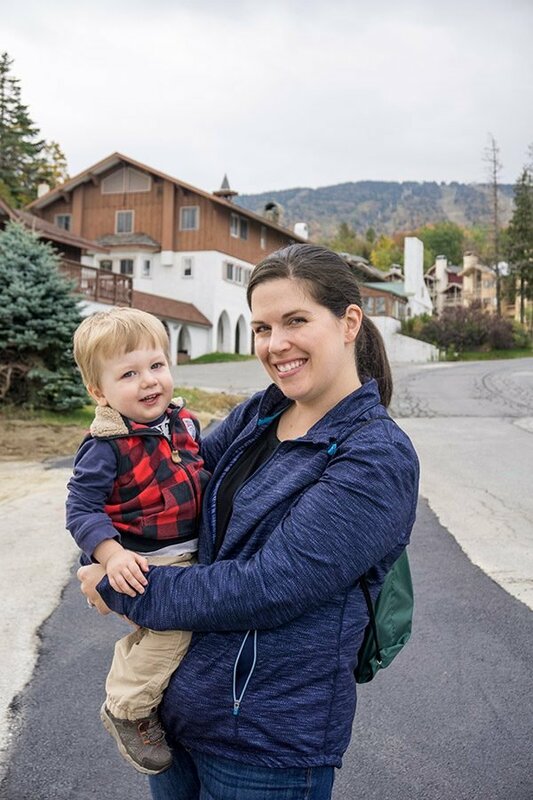 A couple of weeks ago, Laura and I packed up the car and made the short drive over to Stratton Mountain Resort in southern Vermont. As I’ve mentioned before, Robbie isn’t a great traveler, but he survived the 90-minute trip without much trouble. We moved to upstate New York almost 7 years ago now (wow, time flies!! ), and we’ve heard a bunch of good things about Stratton Mountain from friends and neighbors. The Autumn leaves are at their height of color right now, and we decided a roadtrip into Vermont was in order. 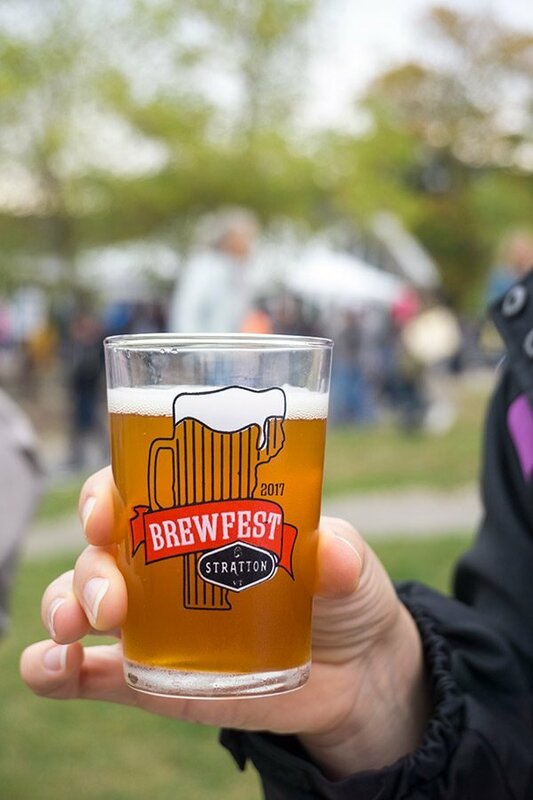 Plus, Stratton Mountain was hosting their annual Brewfest and Chili Cookoff over Columbus Day weekend. Tasty chilies, craft beer and Fall foliage? Count me in! If you’re a big skier, then you might already be familiar with Stratton Mountain. This ski resort is nestled in the southern Green Mountains of Vermont, and the resort is home to 97 trails over 670 acres. (Fun fact: Stratton Mountain Resort was the first major ski resort to allow snowboarding!) While it’s beginning to get chilly here in the northeast, the snows haven’t moved in quite yet. But the base resort was open for business, and we had a blast exploring the area with Robbie. 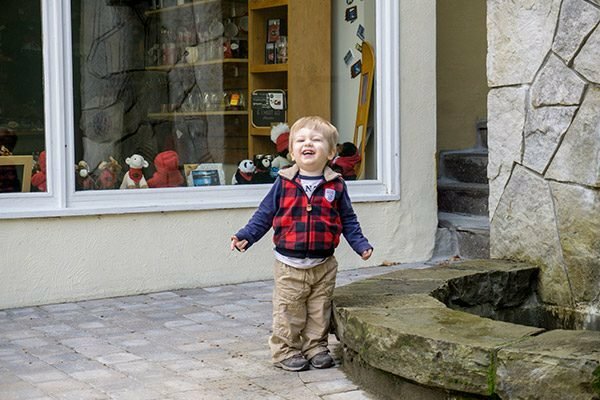 Of course, Robbie’s favorite part of the entire trip was a simple water feature located along the main walking street through the resort. Seriously. Every time we passed the waterfall, Robbie demanded that we stop so he could play for a bit. If you happen to know a toddler, then you already know that some fights aren’t worth having. So while Robbie watched the waterfall, Laura and I sat on a bench nearby with a cup of coffee from the Stratton Mountain Market and Deli. The next morning, we bundled up and took an early morning ride on the gondola to the top of the mountain. The gondola ride offers amazing views of not only the base resort at Stratton Mountain, but also the surrounding White Mountains, Adirondacks, Berkshires and Green Mountains. In fact, on a clear day, you can see 4 states from the top of the mountain! It happened to be a bit cloudy while we were there, so we couldn’t see all 4 states. However, we did get to ride up through the clouds on the gondola…literally. (The gondola disappeared into the clouds before arriving at the summit!) At first, Robbie was a bit nervous about the gondola (“no, no, dola”), but it quickly became his favorite part of the trip. Well, second favorite. There’s no competing with that water feature! I pulled out a couple of fun tricks for this Maple Bacon Chili. For starters, there’s a bit of maple syrup in there. But not too much. There’s just enough maple syrup to add a touch of sweetness to the chili without it tasting like breakfast. But the maple goodness doesn’t stop there! I topped this chili with maple candied bacon. If you’ve never had maple candied bacon, then stop reading right now and go make a batch. (I’m not kidding!) And my last trick for this Maple Bacon Chili was using a combination of ground beef and ground Italian sausage. Add in a couple cans of beans, and you’ve got the recipe for a delicious bowl of chili! Speaking of maple syrup, we wandered into the Pop Shop located in the base resort at Stratton Mountain. The mission of the Pop Shop is to provide a place to feature various vendors and retailers from around the area. While we were there, the Pop Shop was featuring a maple syrup tasting from Runamok Maple. 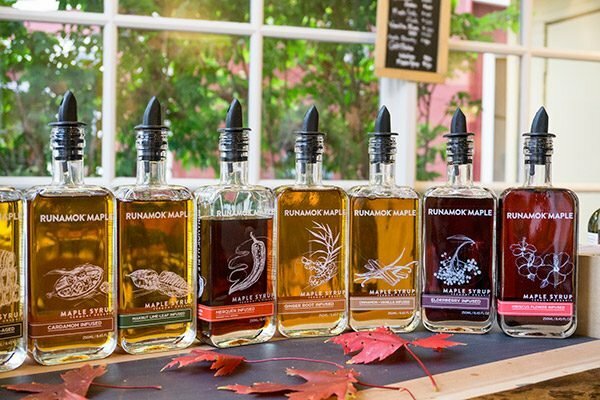 Runamok Maple makes a variety of barrel-aged, infused and smoked maple syrups, and we totally got a head start on Christmas shopping for our families there. (Mom, if you’re reading this, pretend you didn’t see it, ok?) Not only did we have a fun vacation, but we got some shopping done as well! I must admit that the non-ski season might be Stratton Mountain Resort’s best kept secret! 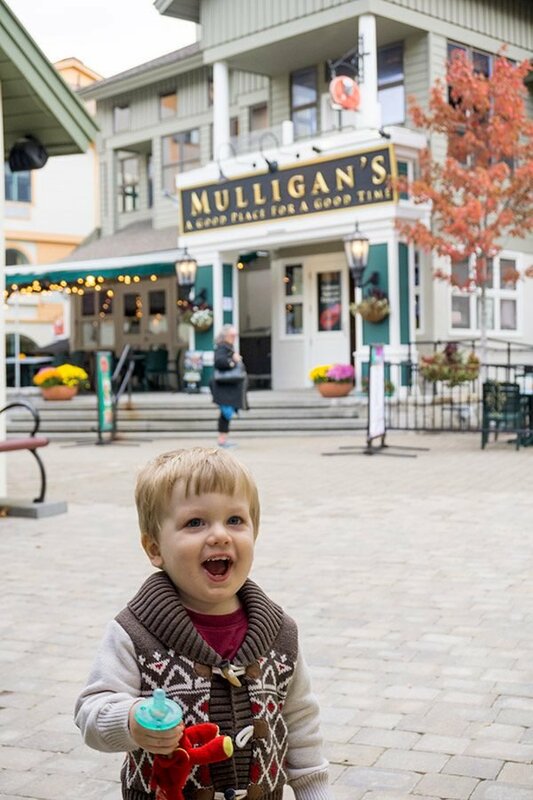 The shops were open, and we had an amazing weekend letting Robbie explore the main walking street through the resort. (Of course, the tasty chili and craft beer was a nice touch, too!) 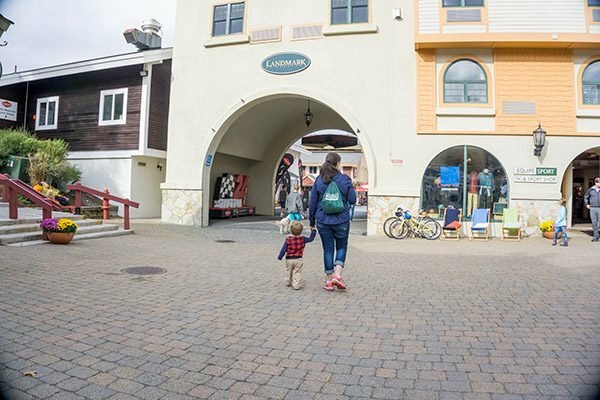 I know staying at a ski resort might not be your first thought during non-ski season, but that’s actually what makes this the best kept secret! 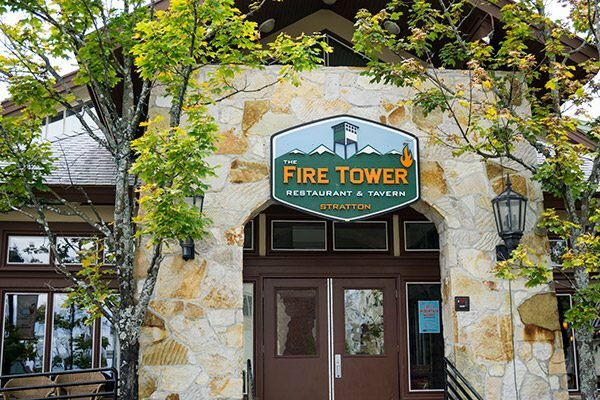 While other lodging in Vermont is at peak in the summer and Fall, Stratton Mountain Resort is actually offering off-peak rates. While you’re thinking ahead about next year’s vacation plans, I suggest making a pot of this delicious Maple Bacon Chili! It’s the perfect meal for a chilly (no-pun intended) Fall evening! Cheers, friends! Place bacon in a cast iron skillet; place skillet over medium heat. Cook until bacon is crispy, but not burnt (~10-12 minutes). 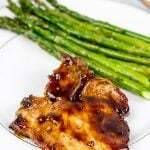 In a medium bowl, mix together the maple syrup, black pepper, and brown sugar. Stir until combined. Add the cooked bacon and stir until well combined. Remove the bacon pieces from the skillet and spread them apart on a piece of parchment paper to dry (~5 minutes). Using a large stockpot or Dutch oven, add 1Tbsp of oil; place over medium-high heat. Add beef and sausage and cook, breaking up with a wooden spoon and stirring occasionally, until completely browned. Transfer meat to a bowl and set aside. Place pot over medium-high heat and add remaining 1 Tbsp oil. Once hot, add onion, garlic and salt. Continue cooking, stirring occasionally, for 6-10 minutes or until onion has softened. Add chili powder, cumin, paprika, chipotle powder and vinegar; continue cooking, stirring constantly, for 1 minute. Add water and bring to a simmer, scraping up any browned bits from the bottom of the pot. Add tomato sauce, tomatoes, kidney beans, black beans, maple syrup and browned beef and sausage; stir until well combined. Increase heat to high and bring to a simmer. Reduce heat to medium-low and simmer for 12-15 minutes, stirring occasionally. Before serving, top with shredded cheese, sour cream, green onions, sunflower seeds and candied bacon. 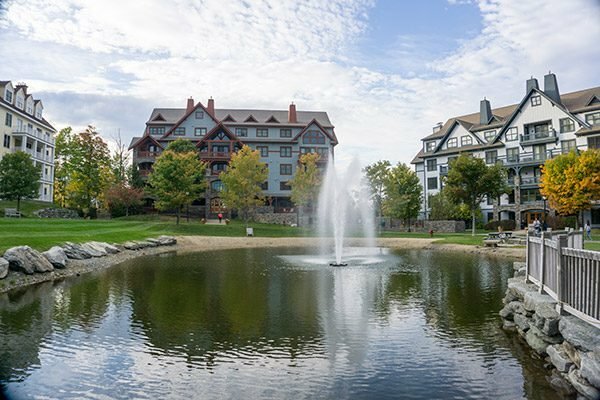 Disclosure: My wife and I received a complementary stay at Stratton Mountain Resort as part of this post. However, all opinions are my own. Thank you for supporting the brands that support Spiced! Robbie is such a doll! Even at my advanced age, I’m still transfixed by a good water feature :). It sounds like you guys had an amazing weekend. I’ve only been to Vermont once, but it was beautiful! Loving the sound of this chili–maple is easily one of my favorite flavors EVER! Hi David! Wow, what a beautiful resort! Vermont is gorgeous; we visisted one of Gary’s sister in Burlington a number of years ago. She has a veterinary practice there. Now, about this chili. I want some and it just barely noon! That maple bacon is calling to me and I like the addition of chipotle. Looks Robbie had a great time! Yes! I totally remember you mentioning Gary’s friend in Burlington. You guys should make your way back up to Vermont sometime…it really is an amazing state! And I have to admit that the non-ski season at ski resorts really is a best kept secret. Laura and I are already talking about going back next year! 🙂 This chili is to die for, too, Dorothy! We were eating a bowl of it last night for dinner, and Laura proclaimed it be her favorite chili of all time…even when compared to her Mom’s recipe. That means it’s legit good!! Thanks so much, my friend, and tell Gary I said hello! Seems that you’ve had loads of fun there, I love these quick family trips. I think your cute little Robbie had the most fun of the three of us… Isn’t it funny watching them grow and laughing at their silly comments and reactions to the world? They are pure pleasure to the heart and soul.. We do not consume pork but we eat turkey bacon which my kids are obsessed about. I think they will love this recipe a lot. Thanks for the inspiration. Oh my gosh, we had so much fun watching Robbie play when we went over to Stratton Mountain last week. Like I mentioned in the post, Laura and I just got a cup of coffee and sat there and watched him play and dance. It was amazing! So I think you can totally sub in turkey bacon and ground turkey for the pork in this recipe, Amira. There are so many wonderful flavors going on in this chili! Thanks so much for swinging by and commenting…I really, really appreciate it! Stratton Mountain Resort looks amazing. I had a look through their site and I just wish Lynne was into skiing as I would love to go there! And it’s only 90 minutes away for you guys too? I need to drive 2 hours from Glasgow into the Scottish Highlands when the snow is there for any skiing to be done. 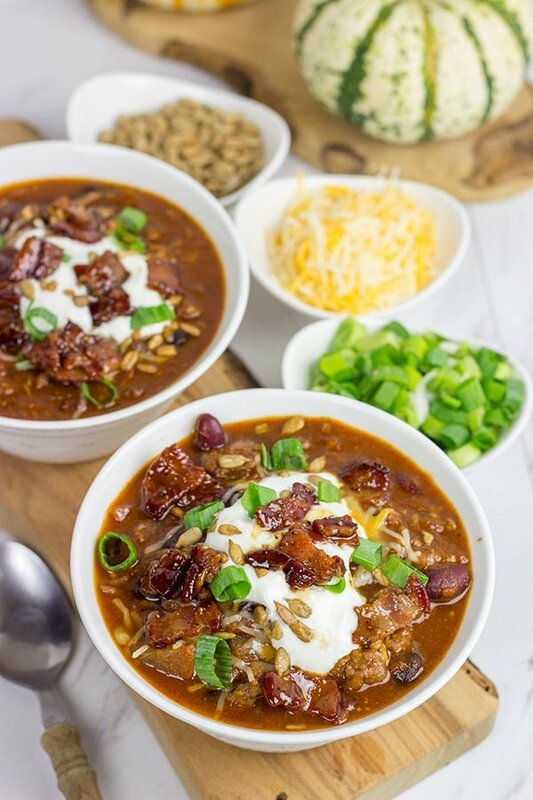 Anyway that maple bacon chili looks like an amazing bowl of deliciousness! Ah! Here’s the thing, Neil. You don’t need to be into skiing to go to a place like Stratton. We were there during the non-ski season, and there were plenty of activities to keep us busy. Although, truthfully, I think I could just hang out there in the main resort on a bench with a cup of coffee. It was such a peaceful and pleasant place to relax! Oh, did I mention that Stratton has some great hiking during the non-ski season? Just in case you happen to know anyone who likes to hike. 🙂 Thanks so much, my friend!! Wow, the Straton Mountain Resort looks like a great place to visit. The maple bacon chili looks amazing. It looks and sounds like you had a perfect weekend. And your version of the winning chili sounds terrific. Maple chili is a new one for me. I’ll bet it’s delicious. Candied bacon, though, we go way back. Way back. I like to make it with thick-sliced bacon and nosh on it as an hors d’oeuvre with cocktail. Although, I’ve never really thought about how candied bacon propbably doesn’t like being referred to in French. David, this sounds amazing! I make chili so often this time of year, and always try to think of new twists – maple and bacon – how great is that! I’m going to have to give this a try. Thanks for the recipe – looks like you all had a fun weekend! 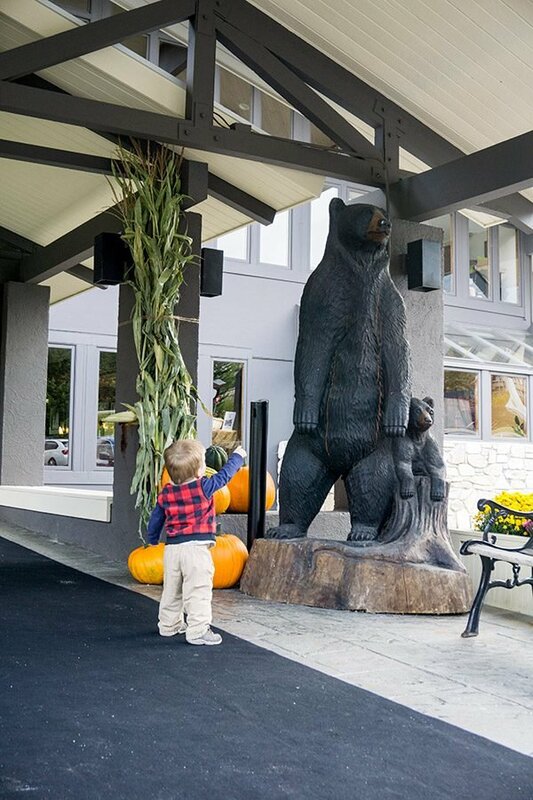 Wow – Stratton Mountain Resort looks fantastic – the perfect weekend gateaway! And – wow – am always blown away when you post pictures of Robbie – he’s grown so much since we saw him – loving his little cheeky smile! And how cool was it that y’all got to enjoy a dinner date AND keep an eye on the lil chap! Also – I checked out that “dola” ride and what a fantastic view – reminds me of the one in Portland we rode on! One time when we come that way any season other than winter, we are gonna have to head up to check out Stratton Mountain Resort! Now – onto this chili – dude! That maple must add so much flavor! One year at the chili cook off here in the Atl, I remember tasting a mapley chili – so many layers of flavors! 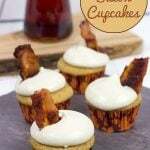 Though that one wasn’t topped with that maple bacon! Simply delicious! Stratton really was a great place to visit, Shashi! 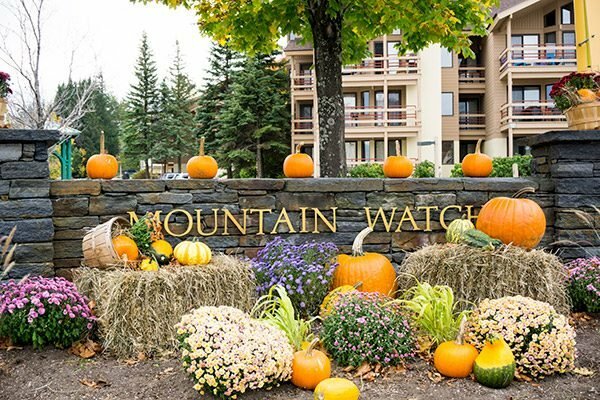 Visiting ski resorts during non-ski season really is the way to go. 🙂 You are absolutely right that Robbie has grown like a weed. Heck, I was out in Denver for a couple of days recently, and I barely recognized him when I got back. He’s changing by the day! I am all about checking out Stratton again. You and lil Shashi will have to come up and we’ll make a trip of it! Plus, there’s chili, and chili makes everything better!! Oh David…looks amazing & beautiful color, this is perfect for fun weekend..and i will definitely make this….Thanks for sharing….! Your family trips always sound so fun David (and you always make me want to move to America! )….Im also drooling over this Chilli! Thank you so much, Frank! I gotta say that the maple syrup in this one is awesome. I know it might sound strange to add maple syrup to chili, but trust me here. 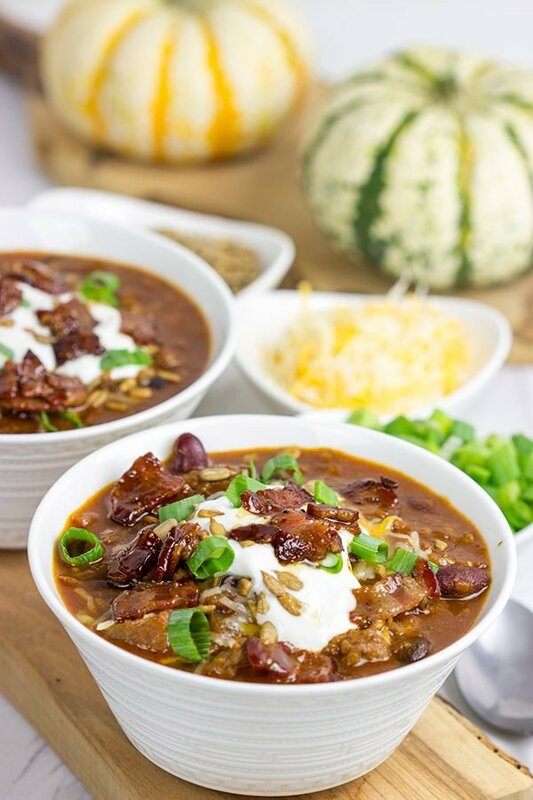 This is our go-to chili now…especially on these early Autumn evenings! What a delightful family weekend you guys had. Robbie looks to have had a grand time indeed. I loved all the pictures. Wow, candied maple bacon! You got me right there without the chili. 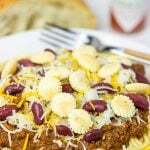 A very interesting chili and tasty sounding recipe. With the cool, no cold weather we’re having a bowl of your chili sounds mighty good. Will be putting this on my “must make” list. Yes! Put this on the “must make” list, Ron. This recipe is now on our list of favorite chilis, and we’ve already made a batch this season. Make sure to cook that bacon low and slow to get it properly candied instead of burnt. (The sugars will want to burn.) 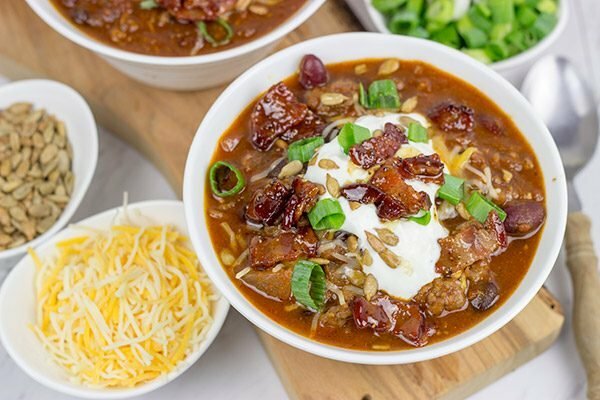 Other than that, this is an easy and different chili recipe…and it’s delicious! Hey Loretta! 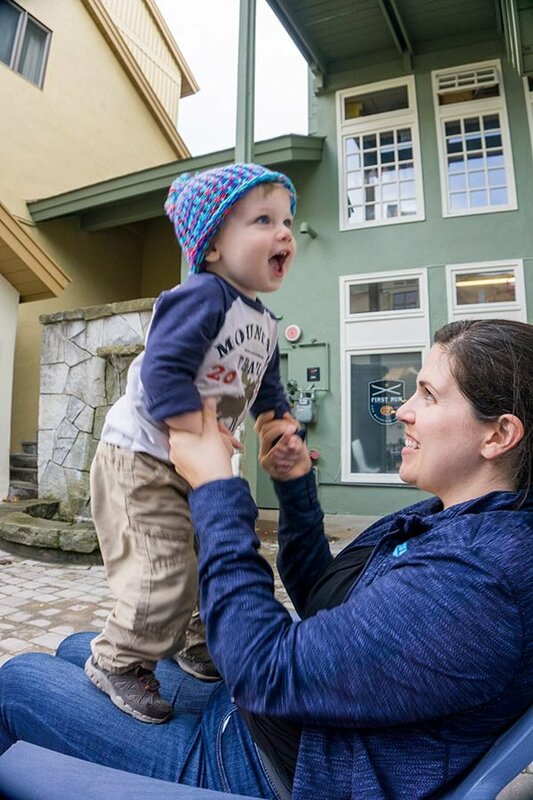 Yes, Stratton is definitely one of our favorite little getaways in the area. We love heading up there when we need to get away for a quick weekend! We’re the same as you when it comes to delicious chili. This one is unique with the maple syrup, but it’s SO good. We’ve already made a batch this year, and I suspect it will show up a couple more times throughout the winter. Thanks so much for stopping by and commenting!